Talk, #actor, #actor kevin d. benton, #actress, #celebrates, #chayil eden, #forgiveness, #kevin's korner, #kupid, #many adventures of kevin nikee, #millennial fm 95.5, #news & sports, #radio show, #talk show, #the kevin & nikee show, #what's bothering nikee, #you get the bell! 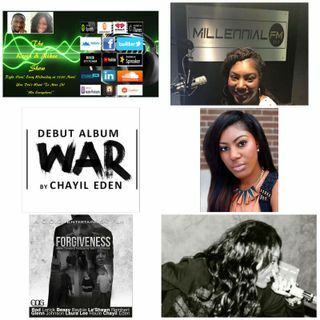 Chayil Eden is an American Female Christian Hip-Hop Recording Artist. Born and raised in Columbia South Carolina, making music and doing it God's way. Hear her awesome message on living for God with no excuse.